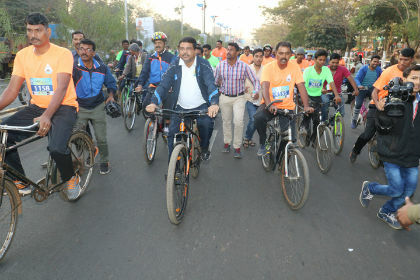 Bhubaneswar: A first of its kind premier Cyclothon event under the banner of Saksham Cyclothon Bhubaneswar was flagged off from Bhubaneswar’s Kalinga Statdium today. Organized under the dynamic leadership of Mr. Dharmendra Pradhan, the young and energetic Minister for Petroleum & Natural Gas and Skill Development & Entrepreneurship, the cyclothon attracted around more than 10,000 participants from all walks of life including officials from various Ministries and the Oil Industry, Sports personalities i.e. first Odia Arjun awardee Minati Mohapatra -cyclist, Hockey player V.R.Raghunath, Athelete Amiya Kumar Mallik , Cricketer Paresh Patel from Odisha, cricketer Munaf Patel, tennis player Poulomi Ghatak and others, Odia cinestar Mihir Dash, Anu Choudhury, Sabyasachi Mishra and Archita Sahu, school and college children cycling professionals. 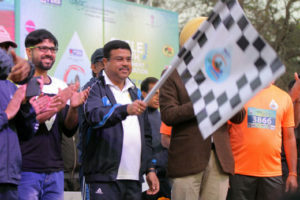 Hon’ble Minister, Mr. Dharmendra Pradhan, Minister of Petroleum & Natural Gas & Skill Development and Entrepreneurship administered the Saksham Pledge and he himself lead the 11 km Green and Fun Ride amidst great excitement and fan-fare to create awareness for cycle. The genesis of this Cyclothon lay in Prime Minister Narendra Modi appeal to people in his monthly radio show Mann Ki Baat about avoiding the use of petrol & diesel for one day in the week to conserve fuels and contribute towards Nation building. The promotion of cycling through this event is aimed at instilling socio-environmental consciousness among citizens towards the larger aim of conserving foreign exchange on fuel imports. Speaking on the occasion, Mr. Pradhan said that benefits of cycling are not only limited to protect environment or fuel conservation but it also carries huge health and fitness dividends. 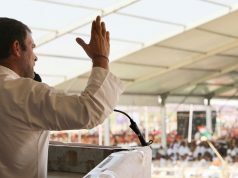 He further said that judicious use of various forms of energy and its conservation is a matter of vital importance to all of us for the betterment of our society and healthy environment. He said that conservation is a collective responsibility of all of us. It will be possible only when the industries, individual citizens, organizations, Oil Companies and the Government share a collective responsibility of petroleum conservation to conserve the available resources of energy and create a cleaner environment for the future generations. Minister Pradhan appealed to all citizens to join in the movement for conserving the finite petroleum resources through practicing simple, easily implementable tips while using petroleum products in cooking, transport, agriculture and industries to extract maximum utilization and efficiency. It also helps us to save money and mitigate the adverse social, economic and environmental impacts associated with oil production and consumption which include air pollution, global warming, water pollution, dependence on import etc. Minister urged to all citizens to come together and work for building a nation that is green, environmentally clean and pollution free. Based on the distance to be covered, the Cyclothon featured three categories – Saksham Elite Race (Men – 33 km/women-22 km), and Saksham Green Ride (11km) from Kalinga Stadium to Khandagiri via Jaydev Vihar Chhak and back to Kalinga Statdium in the same route. While the Elite categories were for serious cyclists, the 11 km Green Rides allowed participants to experience the joy of cycling, while promoting fuel conservation, with the underlying message of reducing excessive dependency on oil for a cleaner and greener environment. 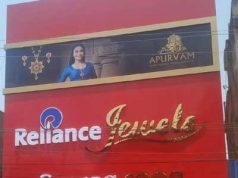 The winner in the Elite (Men’s) category, Rajesh from Tamil Nadu won a cash prize of Rs 1.25 Lakhs, while the Elite Women’s championship Rutuja won Rs 1.0 Lakh. Over 10,000 cyclists participated in the Green ride. Cash prize totalling Rs. 6 lakhs were awarded across various categories. In addition, 50 cycles were distributed to participants through a lucky draw. The Bhubaneswar cyclothon was organized by Petroleum Conservation & Research Association (PCRA), and supported by the oil companies viz. IOCL, BPCL, HPCL, ONGC, GAIL, OIL, MRPL, CPCL, NRL and IGL with technical guidance from Cycling Federation of India. Another more than 70 such cyclothons are planned pan-India over the next 2 to 3 months to sensitize the country to adopt the ideology of conservation for a greener environment.